Northern Ireland uses GBP (Great British Pound) and also some banks there print their own bank notes. They are supposed to be valid in England (or Scotland or Wales) but they can be refused so you’re better to use UK pounds. Scotland has it’s own bills that say Bank of Scotland on them. But they are the same as the GBP that is used in England. The difference between them is: You can use the GBP in Scotland, but sometimes you can’t use the Scottish notes outside of Scotland (you should be able to, but I’ve heard of people who couldn’t). If you have Jacobite leanings, you probably want to use the Scottish bank note, but the notes with the picture of the Queen on them work too. It depends on how much you want to use your credit card. You really won’t need cash for much if you’re on a tour and you can get it there at the ATM. But if you prefer to take some cash with you, you can check with your local bank and see if they work with an exchange company. Ours works with Travelex which we’ve used before and they exchange your money back when you return (with certain parameters). To be safe, don’t take a billfold full of cash and be showing it around. Rick Steves recommends a money belt or neck strap. http://www.ricksteves.com/travel-tips/theft-scams/travel-moneybelt We used them at first, but found they weren’t really needed in Scotland (or Ireland) except for late at night when returning from pubs in major cities (which can be a little dicey). 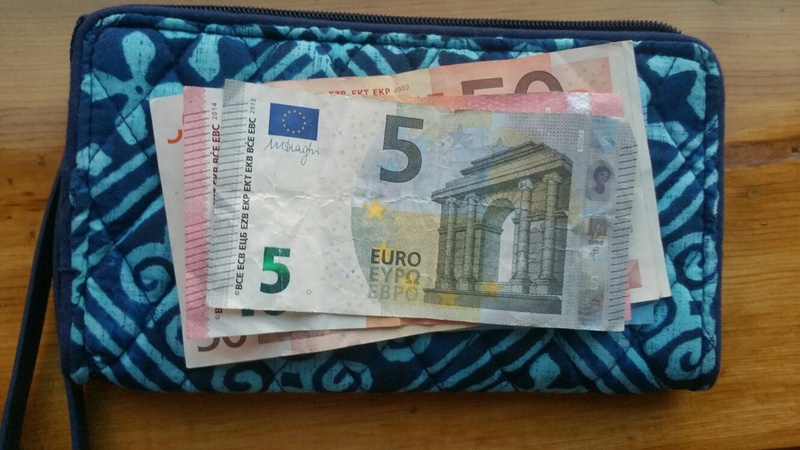 Note on what kind of wallet to take: Their currency is bigger than ours – so it doesn’t fit in a standard American wallet easily, and they give you lots of change in coins so it’s nice to have a change purse. They do have both 1 and 2 pound coins. Size of dollar compared to Euro. Wallet to hold Euros or Pounds. 1) Take more than one. I usually take a) my debit card (for ATMs), plus b) another credit card that I have a pin for that I can get cash with in case my debit card is compromised, and c) another credit card for in case you have to cancel the other one. The “b” card is the one I will use most of the time. The “c” card has a very small credit limit on it and I use it for places that are dicey – like quick shops or computers. See Note below. 2) We make copies of our Credit Cards (back and front), as well as copies of our drivers licenses and passports before we leave. We leave them at home where a relative or neighbor can get to them if needed. 3) Check with your credit card company to see if the card you want to use has a fee to change the money from pounds to USD. If so, ask them if they have a card that doesn’t. You shouldn’t pay for that. And when you’re purchasing something at a store, don’t have the store do the conversion for you – that costs more too. The store in Scotland will offer to charge you in USD. Tell them “No thanks!” – if your credit card company does it for free. 4) Credit cards have better theft & fraud protection than debit cards. 5) Some machines in the UK only take credit cards that have a security chip and you have to enter a PIN when it is used. Check with your bank to see if you can get a card with a chip but if you can’t don’t worry. ATMs use the magnetic stripe and a cashier would be able to run it for you using the magnetic stripe also. 6) American Express and Diners cards are not accepted in many places in the UK. Note: We didn’t print our Ryan Air boarding pass before going to the airport. They won’t print one for you. You have to go to a computer and pay to use the computer and print it yourself. I used my “c” card (see #1 above) and it was a good thing I did because the card was compromised. My credit card company texted me to call because they thought there might be fraudulent use. Someone tried to use it to buy a train ticket in Germany. I had to cancel it. And they sent a new one to my house in Colorado – not much help while I’m in Scotland. If that had been my “b” card with the higher credit limit that I was using on a daily basis, then I would have had a big problem.